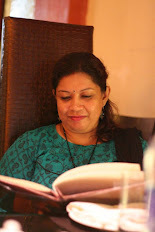 in Festive recipe, North Indian recipes, Paneer, Punjabi cuisine, Veg. Paneer Butter masala is a dish made with panner, dunked in a delightful spicy curry, belongs to Punjabi Cuisine. It is my daughter's most favorite food and one of my best creation according to my daughter, family and friends who have tasted this recipe. For this achievement, I have to thank Mansi of Fun & Food Blog(I am an ardent fan of her blog) for sharing such a wonderful recipe. After I have found her recipe, I never tried any other recipe. I'll recommend everyone whoever going thru this post, try once. I have shared this recipe with many of my friends, too. Tomatoes : 3(big), pureedGinger-garlic paste : 1 tblsp. Dhania powder (dry coriander powder) : 2 tsp. Kasuri methi (dry fenugreek leaves) : 1 tblsp. Tandoori masala (optional for color) : 1/2 tsp. Fresh cream : 3 tblsp. Take the whole onions, take out the skin and blanch them in hot water for 3 mins, then puree them to form a paste. Do the same with tomatoes, unless you are using tomato puree directly. Take 1 tbsp of ghee, heat in a pan for 2 mins, the saute the paneer cubes in it till golden brown; Now take 1 cup hot water, add a pinch of salt and turmeric powder to it and immerse the paneer cubes in it for 10-12 mins. Then remove the pieces, drain them on a tissue paper and keep aside. This process will keep the panner pieces soft as a cotton ball. Add tomato puree, crushed kasuri methi, coriander powder, turmeric powder, garam masala and salt. Stir and let it simmer for some time. Garnish with coriander leaves. Serve the Paneer Butter Masala with any Indian flatbread of your choice like Naan or Paratha, any kind of pulao or simply with jeera rice. Sending one of my creation to my ongoing event, " Spotlight : Show your best creation" , hosted this month by Cuisine Delights. Labels: Festive recipe, North Indian recipes, Paneer, Punjabi cuisine, Veg. I am a die hard PBM fan and this look so well done! Perfect with tandori rotis !!! Gravy looks so rich ....Restaurant style !! 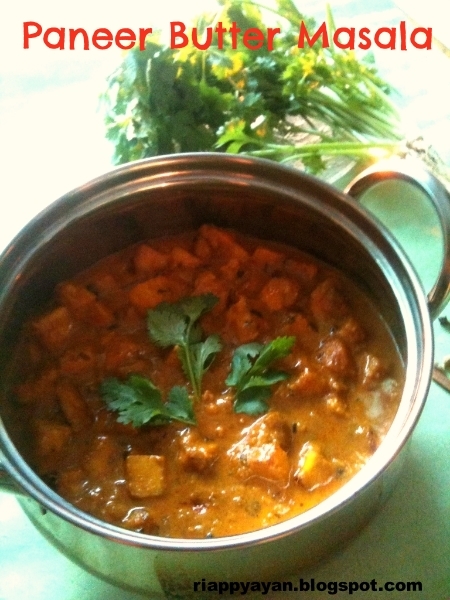 Paneer butter masala looks spicy and yummy. 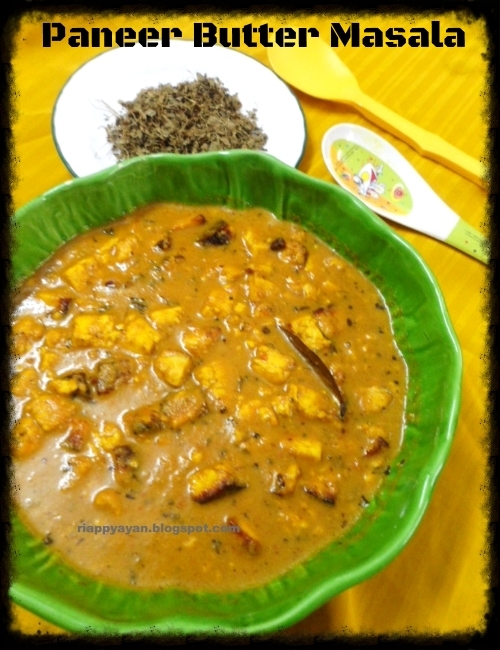 Rich paneer buter masala,the word itself makes me drool, wat a tempting dish. i jst luv paneer in any form... awesome !! 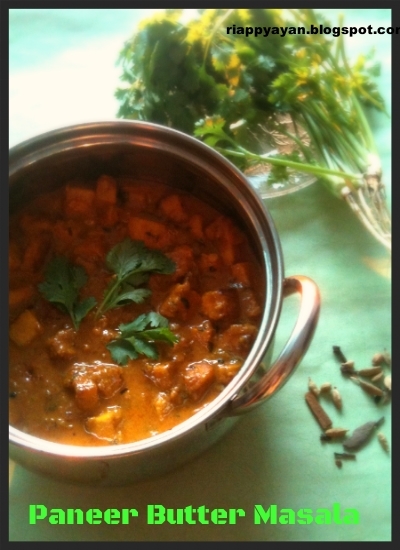 Paneer butter masala looks spicy and yummy. Thanks for linking.